ABSTRACT. This study determined germination responses of 19 species, including trees, shrubs, vines, and herbs, under natural gap and non-gap conditions, in a secondary forest in Chiloé Island, southern Chile, in order to assess if there is any association between the habitat where the seedlings of these plant species occur and their germination requirements. Statistical differences in percentage seed germination were detected in six species in a gap habitat compared to the understory. Five forest edge species (Embothrium coccineum, Escallonia rubra, Gunnera tinctoria, Nertera granadensis and Rhaphithamnus spinosus) presented greater germination success in the canopy gap, while only one forest interior species (Myrceugenia planipes) germinated to a lesser extent in the gap. Percentages of seed germination were not statistically different between the two habitats neither in the remaining 10 edge species (Gaultheria mucronata, Luma apiculata, Myrceugenia parvifolia, Tepualia stipularis, among others) nor in the 3 forest interior species studied (Luzuriaga radicans, Mitraria coccinea, and Myrceugenia ovata var. ovata). Thus, there is no strong evidence of any association between the habitats where seedlings of these plant species grow and their germination requirement. RESUMEN. Respuestas de germinación de semillas en un bosque templado de Chiloé, Chile: efectos de un claro y del dosel arbóreo: En condiciones naturales de un claro y bajo el dosel de un bosque secundario de Chilóe se realizaron ensayos de germinación en 19 especies, incluyendo árboles, arbustos, enredaderas e hierbas nativas, para determinar si el hábitat que ocupan las plántulas de cada especie está asociado a sus requerimientos de germinación. En seis especies, el porcentaje de germinación en el claro fue estadísticamente diferente al de bajo el dosel. En cinco especies de borde de bosque (Embothrium coccineum, Escallonia rubra, Gunnera tinctoria, Nertera granadensis y Rhaphithamnus spinosus), la germinación fue mayor en el claro, mientras que en una sola especie de interior de bosque (Myrceugenia planipes) el porcentaje de germinación resultó ser menor en el claro. Los porcentajes de germinación en el claro y bajo el dosel no fueron estadísticamente diferentes en las restantes 10 especies de borde (Gaultheria mucronata, Luma apiculata, Myrceugenia parvifolia, Tepualia stipularis, entre otras), ni en las 3 especies de interior de bosque estudiadas (Luzuriaga radicans, Mitraria coccinea, and Myrceugenia ovata var. ovata). Por ende, no parece haber suficiente evidencia como para postular que exista una asociación entre el hábitat que ocupan las plántulas de las especies y sus respectivos requerimientos de germinación. Plant regeneration promoted by natural disturbances in forests has been the subject of many studies in southern Chile (Veblen et al. 1981; Veblen 1989). Veblen (1982) and Armesto & Figueroa (1987) studied forests unaffected by massive natural disturbances (catastrophes) in the Coastal Cordillera of southern Chile, determining that they show a gap-phase type regeneration, influenced by natural allogenic factors that may be critical to the regeneration of many forest species in Chile. A gap is a discontinuity in the forest canopy that exposes the soil surface to environmental conditions different to those found under trees (Bazzaz & Pickett 1980). These conditions include higher density of photon flux and an increase in the red/far-red ratio of the light that strikes the soil (Wilson 1965; Goldberg & Werner 1983; Nakashizuka 1985; Lee 1987). Gaps stimulate germination of photoblastic seeds in many heliophytic species, due to an increase in the red/far-red ratio of light (Vázquez-Yanes & Orozco-Segovia 1990a, 1990b). Grubb & Whitmore (1966), Denslow (1980), and Collins & Pickett (1987) recorded greater temperature fluctuations in a gap's exposed soil than in the soil under the canopy, while Washitani & Takenaka (1987) recorded a thermosensitive germination response in some species typical of open sites in temperate regions. Higher temperatures and their greater daily variation in gaps have been shown to stimulate germination of pioneer forest species (Washitani & Takenaka 1987). In temperate forests of the Northern Hemisphere, air humidity is lower in a gap than under the canopy (Collins & Pickett 1987), while, in contrast, humidity in the upper levels of the soil is greater in gaps than under the canopy in tropical forests (Denslow 1987). These physical characteristics of gaps allow certain plant species with gap-favorable traits to invade these sites quickly. Some of these traits may be fast growth rates; low to medium height; short life cycles; small, wind-dispersed and photoblastic seeds; fast germination; and the ability to form seed banks below the canopy (Whitmore 1975; Vázquez-Yanes & Guevara-Sada 1985; Denslow 1987; Vázquez-Yanes et al. 1990). In the present study, we evaluated germination as a possible trait associated to the gap/non-gap dichotomy. In the temperate rainforests of the island of Chiloé, southern Chile, most canopy species apparently regenerate better in gaps (Armesto & Figueroa 1987; Armesto & Fuentes 1988; Bustamante & Armesto 1995), where conditions are characterized by a high frequency of medium-to-small perturbations produced by tree falls, stem or branch decay, soil movement due to rain and wind storms, and the effect of the "epiphyte and vine loads" (Armesto & Fuentes 1988). However, knowledge of seed germination in this region is very scarce and limited to laboratory experiments (Figueroa et al. 1996; Figueroa 1997). In this study, germination responses of different species under gap and non-gap conditions were evaluated in the field. We tested the hypothesis of differential germination responses of 19 species of plants commonly found in the forests of Chiloé, under gap and non-gap conditions, and tested for an association between the habitat of seedlings of these plant species and their respective germination requirements. We expected seeds of species that regenerate in forest edges to germinate to a lesser extent in the understory than in gaps. Germination experiments assays were carried out under field conditions in the Estación Biológica Senda Darwin, 18 km northeast of Ancud, Chiloé, southern Chile (41°S; 75°W). The climate is humid–temperate with an oceanic influence, with a mean annual precipitation of 2200 mm and a mean annual temperature of 9.5 °C. A slight Mediterranean influence is reflected by a precipitation reduction during the summer months (di Castri & Hayek 1976). Vegetation is dominated by typical Valdivian rainforest species of Myrtaceae, Fagaceae, Ericaceae and Berberidaceae (Armesto & Figueroa 1987; Armesto & Fuentes 1988; Gajardo 1994). While shrubs abound in gaps and in open spaces, they are absent or scarce within the forest where mosses, vines and epiphytes are abundant. Mature fruits were collected of the 19 most common species of trees, shrubs, vines and perennial herbs present at the study site (Table 1). Most fruits were collected during winter and spring of 1998, with the exception of Embothrium coccineum, Gunnera tinctoria, and Lomatia hirsuta, whose fruits were collected during the summer of 1999. All the fruits were collected during the period of maximum fruit load at Chiloé (Smith-Ramírez & Armesto 1994; Figueroa et al. 1996; Smith-Ramírez et al. 1998). Seeds were extracted and cleaned manually as soon as they were collected. Seeds were then air-dried for three days in the laboratory. Any seed with evidence of fungal or insect attack was discarded. Table 1. Species of the temperate rainforest of Chiloé selected for the study. Their taxonomic assignment, life form, forest habitat, peak month of fruiting, dispersal syndrome, and seed viability are indicated. The last four characteristics were obtained from Armesto & Rozzi (1989), Smith & Armesto (1994), Figueroa (1997), and Smith et al. (1998). High seed viability corresponds to >75% of viability. Tabla 1. Especies del bosque templado de Chiloé seleccionadas para el estudio. Se indican la asignación taxonómica, la forma de vida, el hábitat, el mes de máxima fructificación, el síndrome de dispersión y la viabilidad de las semillas. Las últimas cuatro características están tomadas de Armesto & Rozzi (1989), Smith & Armesto (1994), Figueroa (1997) y Smith et al. (1998). Una alta viabilidad de las semillas corresponde a>75%. Seeds were sown immediately after drying was completed, and watered manually only once at the beginning of the experiment; afterwards the seeds received only natural rainwater. No scarification or stratification treatments were carried out before sowing. Large seeds (>0.1 mg) were sown in 15 x 6 x 10 cm plastic trays. Smaller seeds were sown in 3 x 3 x 3 cm plastic pots. The soil used for sowing was obtained directly from the forest under study after being sterilized in a high temperature oven (>150 °C). Seeds were sown directly on top of the soil and remained uncovered. To avoid insect predation on seeds and seedlings the trays and pots were wrapped with a white polyester satilene mesh (code 520502) used for serigraphy (<0.5 mm of aperture). The photosynthetic photon flux density reduction resulting from the use of the mesh was estimated to be approximately 20%. To prevent seed predation by rodents and birds, trays and pots were placed inside 1 m3 cages lined with 15 x 15 mm chicken wire (a cage in the gap and other in the understory). The gap and non-gap (understory) conditions were considered as separate treatments. Due to the limited number of seeds available, three replicates per treatment, each with 50 seeds, were used. To consider the possible effect of natural seeds falling from nearby plants, in each treatment a control was used consisting of a tray containing sterile soil but no seeds, also wrapped with polyester mesh. The selection of the gap and non-gap areas was carried out at random in a fragment of secondary forest. The trays and pots with seeds were assigned at random in the area of both treatments. The gap itself was approximately 80 m2 and was surrounded by a fragment of secondary forest with small (6 m-tall) Nothofagus nitida and some medium-sized (12 m-tall) Drimys winteri trees on the eastern side. D. winteri, N. nitida and Podocarpus nubigena trees were dominant in the surrounding forest and the shade-tolerant seedlings of Amomyrtus luma and P. nubigena dominated the understory. The forest edge was covered with small Gaultheria mucronata and Myrteola nummularia shrubs and ferns of the genus Blechnum. Introduced pastures were abundant in the center of the gap. Herbaceous species were cleared inside cages. Thermal variations on the soil surface in the gap and under the canopy were recorded inside the cages every hour between 9:00 and 18:00 h for five consecutive days in winter (June) and spring (September). Photosynthetic photon flux density (PPFD), expressed in mmol of photons.m-2.s-1, was measured on the soil surface inside the cages every hour from 11:00 to 15:00 h during three consecutive days in winter and spring, both in the gap and under the canopy. PPFD was also measured outside the forest in an open site (under direct sunlight). Temperature and PPFD were measured with a LI-1400 Data Logger (Licor, Lincoln, USA). The number of seeds that germinated in the trays was recorded once a month for six months (the proportion of viable seeds that might have germinated after six months was not determined). A seed was counted as germinated when its radicle became visible to the naked eye. An approximate indication of seed viability of each species is included in Table 1. A fixed model repeated measures one-way ANOVA with three subsamples was used for the analysis of results obtained in the gap and under the canopy. Mean percentage germination in gap and under the canopy was obtained from three replicates per species. To satisfy ANOVA assumptions the arcsine square root transformation was applied to percent germination data. Germination within each replicate was calculated as (total number of emerged seedlings/total number of seeds sown) x 100. A fixed model one-way ANOVA was used for analyses of results of temperature and PPFD in each hour from 9:00 until 18:00 h in the gap and under the canopy of the forest. In winter, although not significantly greater, a tendency for mean temperature in the gap to be highest between 11:00 and 17:00 h was detected (P > 0.05). Mean temperature in the gap decreased faster towards 18:00 h than under the canopy (F1,8 = 120, P < 0.05). Mean spring temperature in the gap was significantly greater than under the canopy (P < 0.05) between 12:00 and 16:00 h; there were no differences during morning and late afternoon hours (Figure 1). 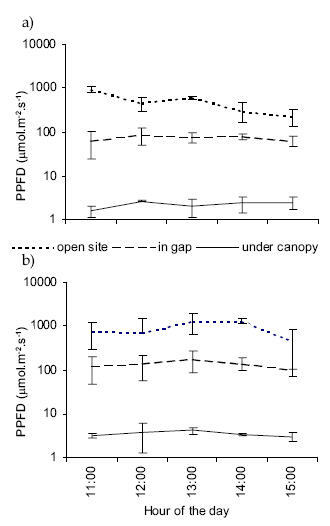 PPFD was about 40 times greater in the gap than under the canopy, and about 300 times greater in the open site than under the canopy during both winter and spring (Figure 2). Figure 1. Mean (± SD) temperature measured hourly over a five-day period during (a) winter and (b) spring, in a canopy gap (dotted line) and under the canopy (full line) of a secondary forest in Chiloé. Figura 1. Temperatura promedio (± DE) medida cada hora durante cinco días en (a) invierno y (b) primavera, en un claro (línea punteada) y bajo el dosel (línea entera) de un bosque secundario en Chiloé. Figure 2. Mean (± SD) photosynthetic photon flux density (PPFD) recorded hourly over a three-day period during (a) winter and (b) spring, at an open habitat (outside the forest), in a canopy gap, and under the canopy of a secondary forest in Chiloé. Figura 2. Densidad promedio (± DE) de flujo de fotones fotosintéticos (PPFD) registrada cada hora durante tres días en (a) invierno y (b) primavera, en un hábitat abierto (fuera del bosque), en un claro y bajo el dosel de un bosque secundario en Chiloé. Significant differences in percentage germination of seeds in the gap vs. the understory were detected in only six species. Of these, percent germination was highest in the gap in three species, Escallonia rubra (100% in the gap vs. 49 ± 5% under the canopy after six months; F1,4 = 212, P < 0.01), Nertera granadensis (90 ± 5% in the gap vs. 23 ± 5% under the canopy after six months; F1,4 = 33.4, P < 0.01) and Rhaphithamnus spinosus (73 ± 3% in the gap vs. 39 ± 6% after six months; F1,4 = 71.4, P < 0.01). Two of the six species did not germinate under the canopy even after six months, Embothrium coccineum and Gunnera tinctoria (71 ± 3% and 86 ± 4%, respectively, in the gap after six months). These five forest edge species represented 33% of all the edge species studied. The percentage germination in one out of four forest interior species studied, Myrceugenia planipes, was greater under the canopy (82 ± 5% in the gap vs. 100% under the canopy after six months; F1,4 = 17.4, P < 0.05). Finally, for 13 of the species studied, namely ten edge species (e.g., Gaultheria mucronata, Luma apiculata, Myrceugenia parvifolia, Tepualia stipularis) and three interior species (Luzuriaga radicans, Mitraria coccinea, and Myrceugenia ovata var. ovata), there was no significant difference between germination in gap and under canopy after six months (P > 0.05). In 12 of the species studied (e.g., Escallonia rubra, Gaultheria mucronata, Myrteola nummularia, Rhaphithamnus spinosus), seed germination was delayed for between one and three months (Figure 3). On the other hand, in seven species (Lomatia ferruginea, Myrceugenia exsucca, M. ovata var. nannophylla, M. ovata var. ovata, M. parvifolia, M. planipes, Ugni candollei), most of the seeds sown in the gap germinated during the second month. By the end of the first month, percentage germination, both in the gap and under the canopy, was high (>50%) in all species within the genus Myrceugenia (Figure 3). Figure 3. Percentage (+ 1 SE) germination dynamics of seeds sown of the 19 species studied both in the canopy gap (empty bars) and under the canopy (black bars) of a secondary forest in Chiloé, between June 1998 and August 1999. Sowing was carried out according to the collecting period of the species. The first month depicted corresponds to the month when seeds were sown. Figura 3. Dinámica del porcentaje (+ 1 EE) de germinación de semillas sembradas de las 19 especies estudiadas, tanto en el claro (barras vacías) como bajo el dosel (barras negras) de un bosque secundario en Chiloé, entre junio de 1998 y agosto de 1999. La siembra se realizó de acuerdo al periodo de recolección de cada especie. El primer mes en cada gráfico corresponde al mes en el cual se sembraron las semillas. 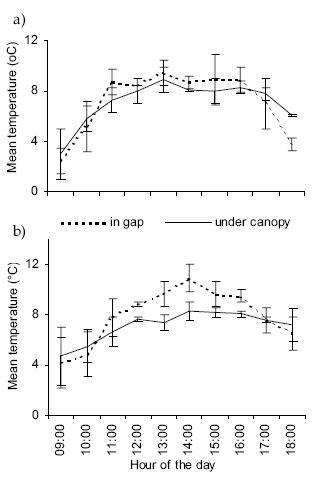 Results of temperature and light measures in gap vs. understory confirmed the thermal insulation effect of tree canopies, an effect that was accentuated during summer (Vázques-Yanes et al. 1990). The measurements of PPFD ratified that the light environment of the understory and canopy gap sites selected for this study were significantly different. In effect, light measurements taken within this forest with two LAI 2000 Canopy Analyzers indicated that light penetration in this canopy gap and under the canopy was 34 and 1% of the total light received in an open site, respectively (Figueroa & Lusk, pers. obs.). The described differences in temperature (during spring) and PPFD (during winter and spring) between the canopy gap and the understory strongly suggest that the differences in germination could be associated with the microenvironmental conditions in each site (Vázques-Yanes et al. 1990). Although we were not able to register temporal and spatial variations in microclimatic conditions in the gap and the understory with enough detail with the methods we used in this study, we could nevertheless still demonstrate that there were noticeable differences between the two habitats in terms of PPFD. However, there might be differences in other factors (e.g., light quality, humidity) that, because of the lack of proper instruments, were not measured (see Vázques-Yanes et al. 1990). Our results strongly suggest that the association between the habitats where seedlings of these plant species are growing and their germination requirements is weak. We expected to find seed germination of species regenerating in forest edges to be somewhat inhibited under the darker forest understory conditions. However, germination of only five edge species, consisting of one tree, two shrubs, and two herbs, was significantly greater within the gap habitat. Only one tree species, Embothrium coccineum failed completely under the canopy, being analogous to pioneer trees that require open sites for explosive germination and fast growth of their seedlings (Vázquez-Yanes & Smith 1982; Washitani & Takenaka 1987; Raich & Khoon 1990). In contrast, germination in the other edge tree species (Lomatia ferruginea, Lomatia hirsuta, Luma apiculata, and Myrceugenia exsucca) was not inhibited under the canopy even though these species do not normally grow within this darker habitat. Germination success of the shrub species Escallonia rubra and Rhaphithamnus spinosus, which are common in forest edges, was twice as high within the canopy gap than under the canopy. However, out of the eight shrub species assayed in this study, these were the only two in which germination was inhibited by the understory conditions. These observations contrast with the general scarcity of shrubs under the forest canopy in Chiloé forests; instead, shrubs grow mostly in abandoned fields and forest edges (Donoso et al. 1984; Donoso et al. 1985; Armesto & Figueroa 1987). Lack of seed dispersal does not seem responsible: 70% of the woody species of Chiloé are dispersed by birds (Armesto & Rozzi 1989), and birds are known to disperse tree seeds in gaps and forest interior with similar frequency (I. Díaz, pers. comm.). Therefore, it is likely that the scarcity of shrubs in understory habitats results from a low survival of shrub seedlings rather than from germination limitations within the understory. Nertera granadensis and Gunnera tinctoria are two common non-woody herb species of edge sites in the forest. Both showed low or nil germination success (<23%) under the canopy and high percentages in the gap (>86%). Germination of both species has been shown to be inhibited by darkness (Willson et al. 1996; Figueroa, pers. obs.). Based on our previous results, we suggest that both species may present photoblastic dormancy (Borthwick et al. 1952). However, this should be corroborated by further studies. Only one forest interior species showed significantly greater germination under the canopy and none of the four interior species studied showed significantly greater germination within the gap. Even in the two vine species, Luzuriaga radicans and Mitraria coccinea, germination was low both within the forest gap and the understory habitat. Seeds of L. radicans likely lose viability through dehydration when they remain in the soil for several months, given their high water content (Figueroa, pers. obs.). Furthermore, recruitment of vines in tropical forests has been proposed to be mainly vegetative (Peñaloza 1985). Hence, there is no evidence for specific germination requirements in these vines, let alone a role for such requirements in determining vine distribution. In contrast, germination of the two forest interior tree species studied here, Myrceugenia planipes and M. ovata var. ovata, was high, both in the gap and under the canopy (>82%). This result is consistent with the great abundance of seedlings of these two species commonly found in the understory (Armesto & Figueroa 1987; Armesto & Fuentes 1988). However, the high germination success of these species in the gap is not consistent with the scarce establishment of these trees in open sites. We suggest that seedling survival and establishment of these two tree species is restricted to the understory. Drought is probably an important cause of seedling mortality in the gap. During the summer of 1999, all M. planipes seedlings were found to die within the first year of life, likely due to severe dehydration, when the seedlings were exposed to gap conditions (Figueroa, pers. obs.). The summer season in Chiloé can be considered a population bottleneck for the survival of tree seedlings within the understory (Figueroa & Castro 2000), and probably even more so in natural treefall gaps. Our field germination data for trees and shrubs in Chiloé argue against the idea of a strong dichotomy in germination success under gap vs. non-gap conditions consistent with the common seedling habitat. Other investigations have also questioned the existence of this dichotomy (Raich & Khoon 1990; Kyereh et al. 1999), that had been previously proposed for tropical species (Whitmore 1975; Denslow 1987; Swaine & Whitmore 1988). We suggest that many of the edge trees and shrubs are absent under the canopy because they cannot survive in the forest shade. This situation can be due in part to greater light requirements for photosynthesis in this species, and not solely because they do not germinate or have a lower germination success within the forest interior. Moreover, tradeoffs between light and nutrient requirements of plants (Lusk et al. 1997), and differential seed predation between light gaps, forest edges and understory environments (Díaz et al. 1999) may also be considered as other factors determining seedling and adult establishment patterns. We conclude that in southern Chile temperate forest species, germination requirements do not underlie a dichotomy of habitat. This conclusion should be corroborated in studies that consider environmental variation through a gradient of gap sizes, the heterogeneity of conditions present in the understory, and the quality of the light reaching the soil (see Vázquez-Yanes & Orozco-Segovia 1990a). We wish to thank C. Lusk for his helpful comments on an earlier version of the manuscript, together with A. A. Muñoz, J. Rabinovich and anonymous reviewers whose comments on this article improved it substantially. We also thank R. Bustamante and H. M. Cabrera who facilitated us with the radiometer, and A. Vidal who installed the protection cages at Senda Darwin. Research financed by FONDECYT No. 3980020 (JAF). Final redaction of manuscript supported by a grant from the A. W. Mellon Foundation to JAF. This is a contribution to the research projects of Estación Biológica Senda Darwin, Ancud, Chiloé.